Location: Sydney and surrounding area, New South Wales. Mark investigates the threats faced by the venomous Broad-headed snake, one of Australia’s most endangered snake species. 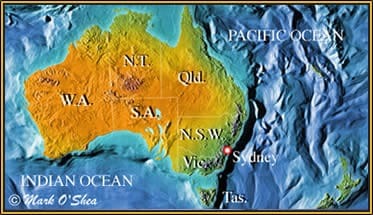 Confined to the Hawkesbury sandstone ridges of New South Wales, most of its former range is now buried under an expanding Sydney. Unfortunately bush-rock collectors and other habitat disturbance further threaten the few locations where it still survives. Mark’s aim is to investigate the current status of the Broad-headed snake on ridges in the Morton National Park, south of Sydney, where Jonathan Webb has previously carried out extensive fieldwork. They then plan to use a helicopter to survey remote sandstone outcrops for isolated populations that may serve as a safe-havens for the species’ survival in the wild. Secondary mission statement: The Sydney funnel-web spider, Atrax robustus, is thought to be the most venomous spider in the world but to the west of Sydney, in the forests of the Blue Mountains, lives a much larger species of funnel-web spider. Ros Whitten and Mark set out to capture a specimen for the Australian Reptile Park, the only place in the world that extracts venom from funnel-web spiders to produce the antivenom required to save the lives of Sydney-siders bitten by them. 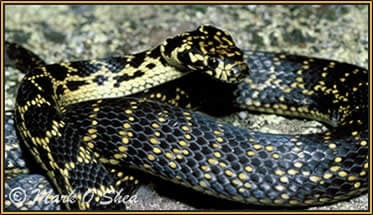 The Broad-headed snake (Hoplocephalus bungaroides) raises and flattens its neck when threatened.